To register for all bridge seminars or special bridge events, please call us at 416-487-8321 or email . NOTE that even if title sounds the same as an earlier seminar, the content and hands are always different. NOTE ALSO that times are now 9.30 am - 11.45 am. If you have to leave early, that is just fine. If you are unable to come, please call us well in advance as space at our BRIDGE SCHOOL at 2737 Bayview Ave is limited to 50 people. Seminars are $25.00 each if pre-paid prior to the class OR $30.00 at door. Do you love playing bridge? Have you taken either the Basics or Intermediate I course and looking to do more this Spring? Have you noticed that you are defending at bridge 50% of the time? That is right! Did you know that being on Defence is the most fun you can ever have at the bridge table even when you do not have any points in your hand? We at the Barbara Seagram School of Bridge are pleased to offer you for the very first time a series of 4 weeks so you can learn the basics of Defence. We are so fortunate to have Lorraine Eaglesham teaching this course for us. As many of you know, Lorraine is a born teacher. She has a great sense of humour, and her ability to make even the most difficult bridge concepts understood is a strength we rarely see. Do not wait! Sign up today! Payment can also be made by Interac email transfer. Contact Josée at or by cell, 416-300-9140 if you have any questions or for the password or additional information. Cost: $310 includes taxes and text book. For brand new players to the game & for those who have been away from the game for a long time. Cost: $260 includes taxes and text book. For those who feel rusty and need a refresher and for those moving up from Basic lessons. Intermediate III is a full course on Defence and Conventions. DEFENCE: Third Hand Play, Second Hand Play, Suit Preference Signalling, Strategy on Defence, Lead Directing Doubles, Discarding. CONVENTIONS: Negative Doubles, Jacoby 2 NT as a forcing raise, Jacoby Transfers, Texas Transfers, Splinters, Roman Key Card Blackwood, Cue Bids, Slam Bidding and lots more! Cost: $110 includes taxes and text book. Learn the system that most of North America now plays. It makes it much easier to get to a better contract, easier to find slams on fewer values, and easier to know when to stop in a part score. Learn the forcing No Trump bid system. Sign up now for Spring Bridge Lessons with Josee or Stephen - - 2019 SPRING REGISTRATION FORM - - Space is limited. This game is for newer players who will so enjoy the atmosphere in this game while improving your skills. NEW PLAYERS, BE SURE TO ATTEND THIS GAME. Make a bid, change your mind, then make a new bid! Make an opening lead, change your mind, then make a new opening lead! Ask the director what to do before you do it, then do it! 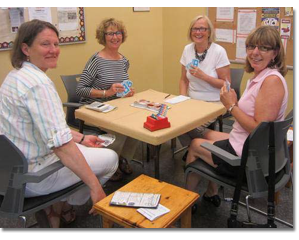 Learn how to play duplicate bridge in an easy going environment. You will have so much fun and you will learn so much! Master points will be issued! Cost $11 per person payable at the door. Come with or without a partner. No need to pre-register. We really need some volunteers to help with this game. 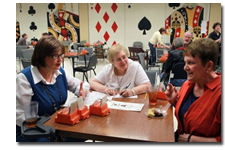 Please email Barbara or Josee Hammill if you might be able to help us with these weekly games. Even if you could attend once a month, that would be a huge help. Many students have questions (which is why they are there) and help is needed. Ann K., Susan Trumper, Bonita, Linda U., Leila and Carol have been an enormous help to date. We thank them. HAND RECOREDS AT END OF GAME!! Cost $11 per person/game payable at the door. Steve is a very competent director and a very nice man. You will enjoy this game. This game is a stepping stone up from Tuesday afternoon games where you can ask questions & have help on any hand. In Steve's games, you can ask questions after the hand or in between rounds, if time permits. 1399 Bayview Ave SE corner Bayview & St. Cuthbert's Rd. Please visit www.stcuthbertsleaside.com for additional info on location. Temple Sinai at 210 Wilson Ave. @ 6.45 pm. Parking is available in church parking lot. Free parking also available on both sides of Bayview after 6.00 pm. Also on side streets. Enter through side doors on North side and proceed to the right. Go through the door at the end of the hall (closed fire door) and then down a small set of stairs (5 steps) and you will be in our bridge room. Welcome to Daniel's Bridge School hosted by World Champion, Daniel Lavee. 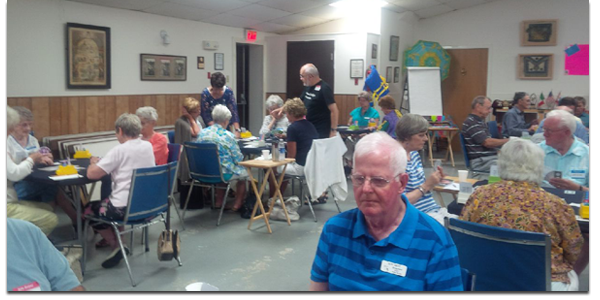 Every Monday evening, Douglas Jordan and I host a Supervised Duplicate game for new or less experienced players. The atmosphere is relaxed and friendly. You may ask me questions during the bidding, play, or after the hand if you wish. You may bring cheat sheets to refer to at any point. No partner is required - I will make sure you are in the game. Free cookies and free coffee are offered.